It is important for anyone that considers using a training, rehab or fitness system to receive independent reviews. As the manufacturer, we always promote the fact that EXER-GENIE has an incredible history of use in performance enhancement because of the diversity of training concepts someone can implement. 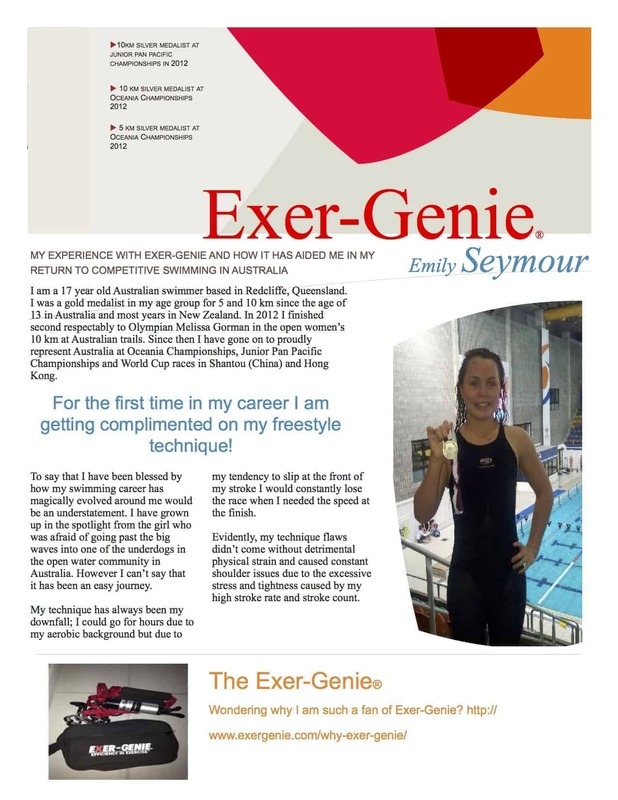 MY EXPERIENCE WITH EXER-GENIE AND HOW IT HAS AIDED ME IN MY RETURN TO COMPETITIVE SWIMMING IN AUSTRALIA I am a 17 year old Australian swimmer based in Redcliffe, Queensland. I was a gold medalist in my age group for 5 and 10 km since the age of 13 in Australia and most years in New Zealand. In 2012 1 finished second respectably to Olympian Melissa Gorman in the open women’s l0 km at Australian trails. Since then I have gone on to proudly represent Australia at Oceania Championships, Junior Pan Pacific Championships and World Cup races in Shantou (China) and Hong Kong. For the first time in my career, I am getting complimented on my freestyle technique! To say that I have been blessed by how my swimming career magically evolved around me would be an understatement. I have grown up in the spotlight from the girl who was afraid of going past the big waves into one of the underdogs in the open water community in Australia. However I can’t say that it has been an easy journey. My technique has always been my downfall; I could go for hour due to my aerobic background but due my tendency to slip at the front of my stroke I would constantly lose the race when I needed the speed at the finish. physical strain and caused constant shoulder issues due to the excessive stress and tightness caused by my high stroke rate and stroke count. It was at the conclusion of my representation on the world cup circuit that I realized the debt of the big year of competition was going to be bigger than expected. It was then in late December 2012 after two desperate attempts at 10km races that my forced break begun as 1 knew that it was too late to look towards putting together a good national race preparation. Since returning to the water temporarily in February before again having my progress disrupted by an operation in April I have returned with a new found desire to improve and my technique has become my primary focus. My current coach, Richard Sleight, had emphasized that until l could engage at the front of my stoke and improve my efficiency it was likely I would end up in the same situation. That’s when I found out about the Exer-Genie. I met company owner and UK coach Tony via his page ‘Swimmers Acceleration’ on Facebook. The Exer-Genie’s ability to offer variable resistance without the familiar snap-back of my classic set of stretch cords (that had caused weird habits to occur in my swimming and didn’t offer a resistance replicating that of the ideal freestyle stroke.) it has allowed me to mimic the positions of my freestyle and focus on engaging the correct muscles at the right places in my stroke. I fell in love with the fact that the Exer-Genie system fits in my swim bag. This has allowed me to take it with me to training and at home. Through my usage of the system, I have been able to slowly increase the resistance and focus on a combination of isometric connection and interval training in a program devised by Tony himself. The short course racing season has offered measurability for my speed in the pool. Since my physique changed at age 14 1 hadn’t been competitive nor improved whatsoever. Looking back on my race analyses from 2012 my stroke counts were averaging 50 per 50m, stroke rates were through the roof and evidently my exertion was astronomical to achieve average times. At my most recent competition which was our state short course titles, I did what I would say is my best performance both in respect to speed and my stroke. I went out comfortably with a low to mid 40 stroke rate and held a smooth stoke with at least 6 less strokes per 50m than in the past. I was stoked to find out that I had swum equivalent or just under my all-time 100, 200, 400 and 800 times with only three months back in the water and seemingly less exertion. I couldn’t have done it without my Exer-Genie and I am looking forward to incorporating it further into our squads (we have purchased 1 O) training routine leading into the summer.